Crop Insurance Professionals Association signed two letters this week that were circulated on Capitol Hill. The first letter CIPA signed alongside 194 other commodity and crop insurance organizations advocates Members of the House of Representatives to vote in favor of the Farm Bill passed out of the House Committee on Agriculture. CIPA also signed a letter requesting Congressmen to oppose all amendments to the Farm Bill that will be harmful to crop insurance. Please feel free to circulate the letters linked to above to your Representative with notes telling them crop insurance is important to their constituents. CIPA signed on to a letter expressing support for crop insurance and opposition to any action that would “discourage producer participation or undermine private sector delivery.” The letter was sent to every Senator and Representative in Congress. Alongside CIPA, a strong showing of commodity groups – over 40 total – signed on to the letter proving broad support of Federal Crop Insurance. Read the letter sent to the House and Senate. National Crop Insurance Services released an outstanding video featuring farmers, agents, and adjusters all reacting to the critics’ claims that “farmers are praying for a drought” so they can collect on crop insurance, and that they are “laughing all the way to the bank.” Farm Policy Facts (FPF) is helping circulate the video and press release. Please help circulate the video to your farmer clients, fellow agents, family and friends. Another successful membership meeting is in the books. CIPA members met Monday afternoon in Indian Wells, California in conjunction with the Annual Industry Convention. The meeting was led off by Tom Sell of Combest, Sell & Associates who gave a Washington D.C. report. Following Tom’s presentation, Brandon Willis, Acting Administrator of RMA, hosted a roundtable discussion with CIPA members to discuss future challenges and opportunities for Federal Crop Insurance. For information on joining CIPA, please visit the membership page or contact us at 202.544.5873. Thinking about joining Crop Insurance Professionals Association? CIPA represents independent crop insurance agents from across the country on legislative and regulatory affairs in Washington D.C., in addition to providing a forum for the top agents in the nation to network with each other and exchange information and ideas. CIPA members are kept up-to-date on the latest issues facing crop insurance by the leadership team, which is led by Larry Combest, former Chairman of the House Committee on Agriculture and principle author of the 2000 Ag Risk Protection Act (ARPA) and the 2002 Farm Bill. You can learn more and apply for membership here on our website. You may also refer to our membership factsheet for more information. Recently all CIPA Supporting Members received the biannual newsletter, CIPA Standard, a 6-page formatted document containing CIPA news and activities reports, a fall farm bill prognostication and update, and CIPA PAC information. To receive your copy of CIPA Standard, please join CIPA as a Supporting Member for the nominal annual fee of $10. Supporting Membership is for anyone whose livelihoods are affected by crop insurance. In addition to receiving the newsletter, Supporting Members are granted access to additional resources on the website and allowed to contribute to the CIPA PAC. Please feel free to contact us at 202.544.5873 with any questions. Your July 25 editorial “Drought and the Farm Bills” implies that farmers are somehow purchasing crop insurance policies as a way to get rich. Nothing could be further from the truth. Crop insurance has become the chief risk management tool for farmers for one simple reason: It works. Farmers purchase policies and can receive claims only for documented losses. As you noted, most of the United States is locked in a severe drought this year. Crop losses may be deep, and no crop insurance indemnity will be enough to make any of these farmers whole again. The indemnity will allow those who purchased policies to get back on their feet and farm yet another day. Do you think that drivers who purchase car insurance are secretly hoping for a car wreck to get a check from the insurance company? It’s an absurd idea. You purchase insurance for protection, not to make a buck. As a crop insurance agent, I can tell you that there is nothing farmers want more than a bountiful harvest. But if Mother Nature does not cooperate, and it looks as if she won’t this year, farmers will need crop insurance as a backup plan. After the release of the House farm bill last week, CIPA joined with Independent Insurance Agents and Brokers of America (Big I), and the National Association of Professional Insurance Agents (PIA) in sending a letter to Chairman Frank Lucas (R-OK) and Ranking Member Collin Peterson (D-MN) expressing support for the bill. In the letter CIPA commends Mr. Lucas and Mr. Peterson for constructing a “bipartisan farm bill that honors the request of producers to do no harm to Federal Crop Insurance.” The letter goes on to express support for numerous aspects of the bill. You can read the entire letter here. "The EWG is skilled in information manipulation and persuasion, and it has been at the forefront of eliminating much of farm policy in recent years. Ironically, while the United States has been taking tools away from its farmers as a result, our biggest foreign competitors - some of the worst environmental offenders on the planet - have been ratcheting up subsidization levels. The EWG hasn't seemed to care." Mr. Bowen goes on to clearly articulate why crop insurance is essential for farmers like himself in managing their unique risks, and why anti-crop insurance amendments being considered in the Senate farm bill debate should be defeated. Please find the entire article here. 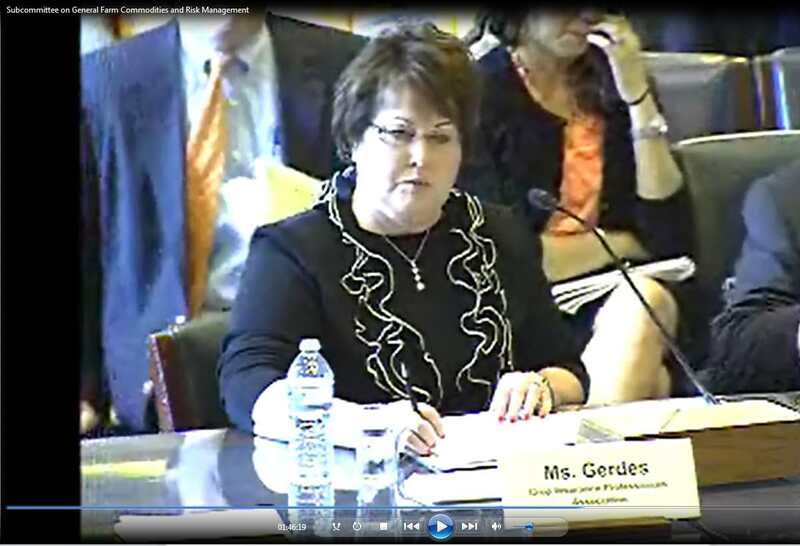 Ruth Gerdes, CIPA Member and Regulatory Affairs Committee Chair from Auburn, Nebraska, testified at the House Agriculture Committee on Thursday, May 17, 2012. Ruth told the committee her own personal history with crop insurance – how her family almost lost their farm in the 1980’s because they had been sold the wrong crop insurance coverage – and how that spurred her into becoming an agent. She vowed to never let what happen to her family happen again to them or their neighbors, and ever since she has been dedicated to building and improving Federal Crop Insurance into the success story it is today. The screen shot below is linked to the House Agriculture Committee website, where a video of the hearing can be found. Ruth was on the fourth panel of the hearing and comes on the video at the 1 hour 45 minute mark. You can also read Ruth's written testimony.